Do you ever doubt food bloggers when they don’t provide a single source of inspiration for an amazing recipe? Like, how did they come up with that genius plan on their own? Or, sometimes, I know I’ve seen a certain recipe on such-and-such popular food site…they totally copied it! I think this all the time. It’s either out of envy for the recipe’s internet success, or awe of their culinary skills if they truly did invent such a delicious recipe. 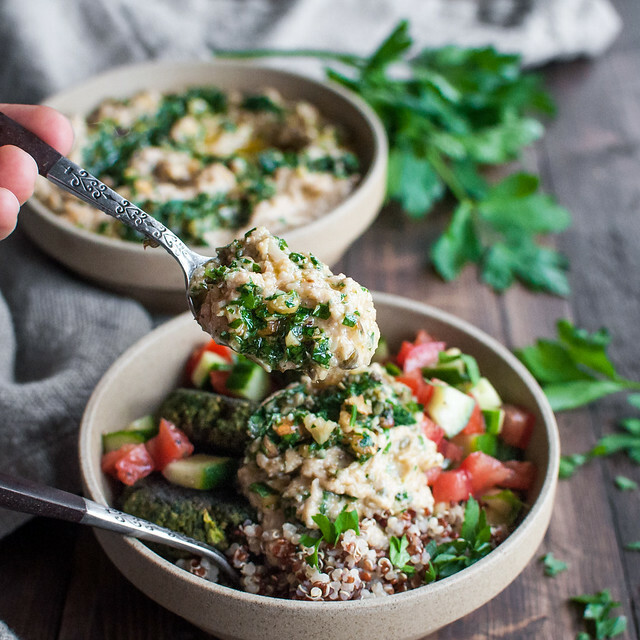 And yet, I don’t credit today’s Mediterranean-inspired roasted zucchini dip to any definable source, because there is SUCH a massive circle of influence that went into it–it would be no easy task to list them all. In the end, my recipe doesn’t look very close to any one of them, but I could say it was inspired by them all. 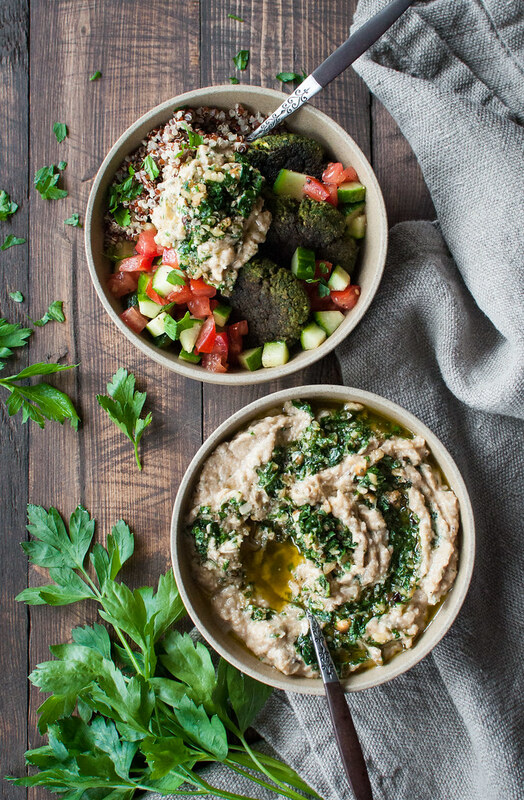 What I really wanted to do was create the delicious zucchini baba ganoush that I tasted at Snap Kitchen back in February. I’m heading back to Dallas right now (like, sitting at the airport writing this post), so I’ll get to sample the zucchini dip again and do a complete culinary analysis of it. If I remember correctly, though, it’s quite green in color, as portrayed on Snap Kitchen’s website. They must use their magical voodoo powers to accomplish the color, or else a SERIOUS amount of basil, because after locking down my own recipe and viewing many similar ones online, zucchini dip is almost always a very ugly brown. I don’t judge brown food. Chocolate, gravy, the golden brown outside of a grilled cheese, lentils–they’re all less than colorful. The best way to remedy that? Just like New Yorkers like to pretend to spruce up their drab wardrobes, with a pop of color! Maybe that’s why sprinkles go so well with chocolate, tomato in grilled cheese, and a rainbow of toppings with my taco spiced lentils. 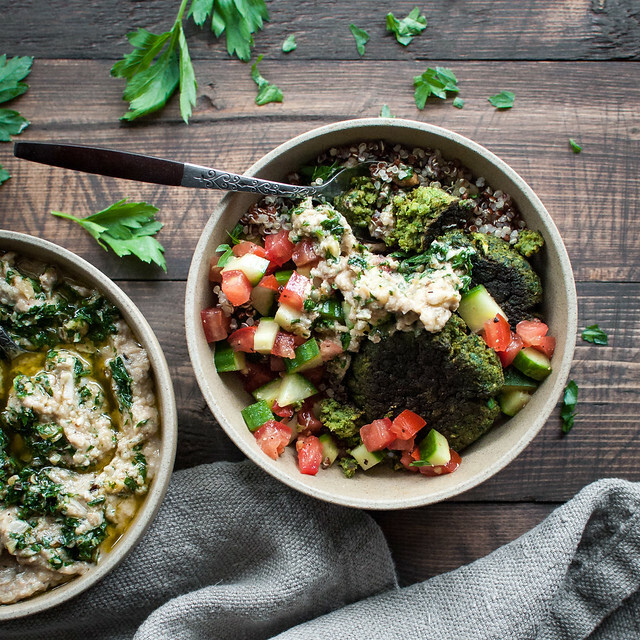 And now…salsa verde in zucchini dip. One of the posts I read in preparation for this recipe was Deb’s smoky eggplant dip. She honestly admits her misconception of baba ganoush, and, similarly, I have to confess my ignorance of authentic salsa verde. My big surprise? Salsa verde is not, technically, tomatillo salsa, which is how I would have confidently explained it to you a week ago. 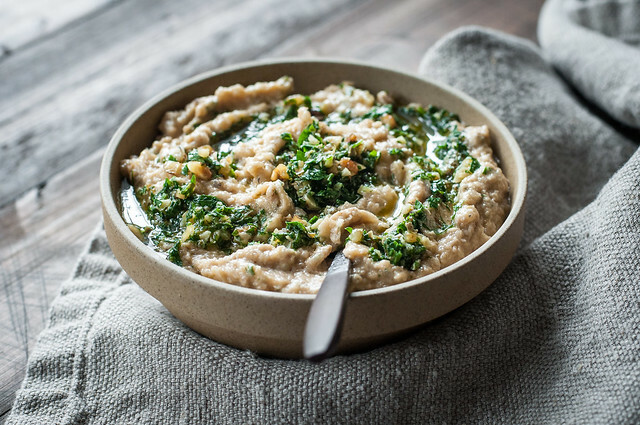 I know that what I wanted to make with my zucchini dip was a mixture of chopped nuts and herbs and some good olive oil, and that, my friends, is exactly salsa verde. 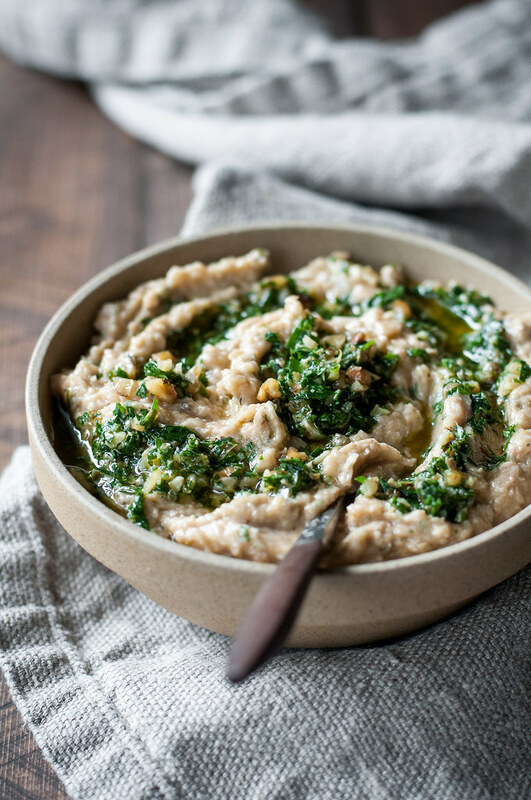 Now, it can be difficult, if not impossible, to find concrete culinary answers on the internet, so you’ll still find hot debates over moutabal versus baba ganoush, and I’m sure you can find sources to define salsa verde as more of a Mexican condiment. Just a disclaimer. Don’t believe everything you read on the internet. Even me (sometimes). I was more than sad to toss the leftover zucchini dip as I cleaned out the fridge this morning, moved some items to the freezer, and ate the last of the enchiladas for lunch. Steve and I are en route to Dallas, hoping the warm weather is sufficient to obliterate our scratchy throats and runny noses. As it always does, summer turned to fall overnight in Connecticut, ushered in by three days of rain courtesy of our usual fall hurricane. Despite feeling kind of miserable and not super into food, I took advantage of the rainy weather, hunkering down in the kitchen to test recipes so the blog can go on this week, as I’m kitchen-less! I think you’ll like what I have in store :) We’re keeping mostly with the Tex-Mex theme (my least favorite food, can’t you tell? ), which happens to work well for fall gatherings in any part of the country or world. Meanwhile, follow me in Instagram to stay updated on my Dallas adventures! It’s an exciting week, which includes Steve’s 35th(!) birthday, the Texas State Fair, my sisters and brothers-in-law, maybe a tiny bit of meat(!!! ), and some good ol’ college football. I brought my real camera and hopefully will remember to tote it around and use it. The zucchini dip and extra salsa verde! 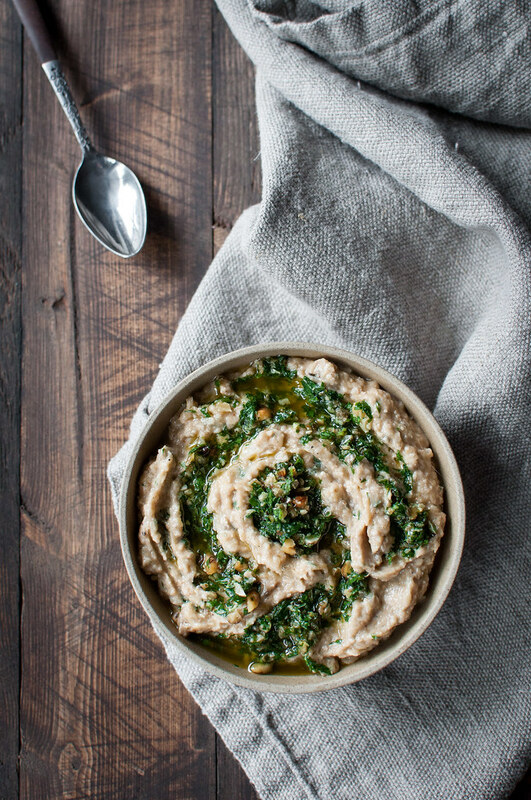 A creamy, summery spin on baba ganoush! Fresh and green salsa verde brightens up the smooth flavors of roasted zucchini and toasted walnuts. Preheat broil and move oven rack about 6 inches from heat. Line a rimmed baking sheet with foil and wash and dry the zucchini. Prick each zucchini in 6 to 8 places with the tip of a sharp knife, then brush the outside of each with olive oil and place on baking tray. Broil about 20 minutes, until dark brown over most of the surface, and zucchini feel soft and heavy. Turn every 5 minutes to evenly expose skin to the flame. Allow to cool slightly on the tray, the cut off stems and split lengthwise. Use a spoon to scoop out most of the seeds, then place in a colander over the sink or a bowl for about 10 minutes to drain. In the food processor, pulse garlic, walnuts, lemon juice, and half of a single zucchini until they form a nearly smooth paste. Add remaining zucchini, a tablespoon of olive oil, mayo, and onion. Pulse very quickly about 10 times, until the zucchini is nearly smooth but not completely. Remove to a bowl and stir in ½ teaspoon salt, lots of fresh ground black pepper, 2 tablespoons salsa verde, and a splash of hot sauce or a pinch of cayenne (I used both--I like it a little spicy and they lend different flavors). Adjust seasoning to taste, then refrigerate until chilled. The flavors will continue to develop, so taste again for seasoning adjustments before serving chilled or room temperature. 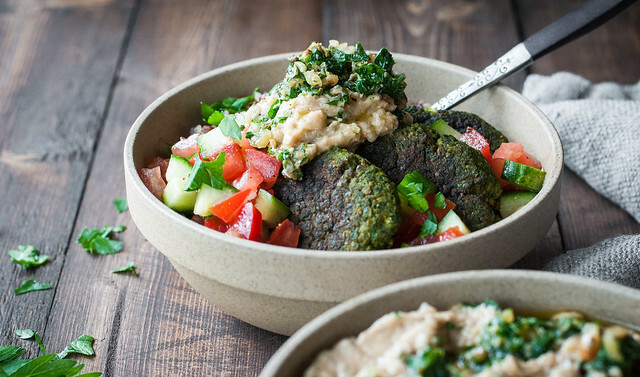 If serving with a protein (like these green falafel), you may even warm the dip slightly. Garnish with extra salsa verde or some chopped walnuts or parsley. Stir together all ingredients except vinegar, salt, and pepper. Just before serving, add vinegar and season to taste (if you add vinegar ahead of time, the world won't end, it just may take away some of the color from the parsley). Salsa verde recipe barely adapted from Deborah Madison's The New Vegetarian Cooking for Everyone. The whole recipe (and the whole bowl in the photos!) is vegan and gluten-free, if you use Just Mayo or another vegan mayo. Prep and cook times don't include toasting the walnuts, but it's easily done while you have downtime in the kitchen. Spread walnuts in a single layer on a baking sheet and bake at 350 (F) for about 10 minutes, until they smell delicious and have started to darken. Remove to a dry towel or bowl so they stop cooking. Note: This page contains affiliate links. It does NOT contain sponsored content. 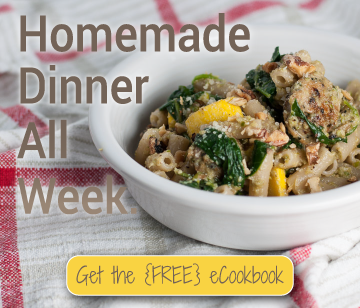 Affiliate links (to products I recommend, on Amazon) offset my ingredient and website maintenance costs, so I can keep bringing you creamy recipes like this one. Thanks!